When you close your eyes, do you dream of riding your bike in the Italian Alps? Do you have a picture of Valentino Rossi hanging above your bed? 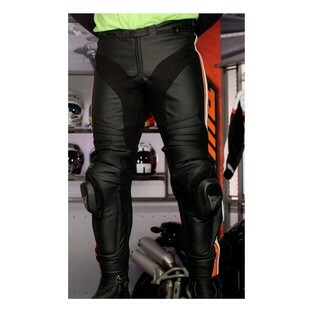 Well, Dainese may be listening to your thoughts, because they have a pair of pants made just for you. The Dainese Misano Perforated Pants are the new top-of-the-line race pants. They'll take you to hell and back, provided hell has some gnarly motorcycle race tracks. With the price of admission upwards of $500, Dainese provides no shortage of features. First up is Dainese's top-notch D-Skin 2.0 leather, premium cowhide impregnated with Silicone for more abrasion resistance. That helps the Misano Pants reach a CE Level 2 rating, which doesn't hurt. The pants also use S1 bielastic stretch panels for comfort and breathability, along with a Nanofeel liner with Silver ion treatment to keep things from getting too funky down-under. And if all that wasn't enough, the pants also come with hip armor as standard. No more will you have to spend more to have protection that you should already have. While it may not be a drastic overhaul, the new Misano Pants are a clear step forward for Dainese. All of their latest goodies and features thrown into a new bomb-proof leather race pant means your stems will be well protected for all your future track and street endeavors.